Who uses NASA Earth science data? Katherine Pitts, to study the impacts of climate change and analyze remotely-sensed geophysical data. 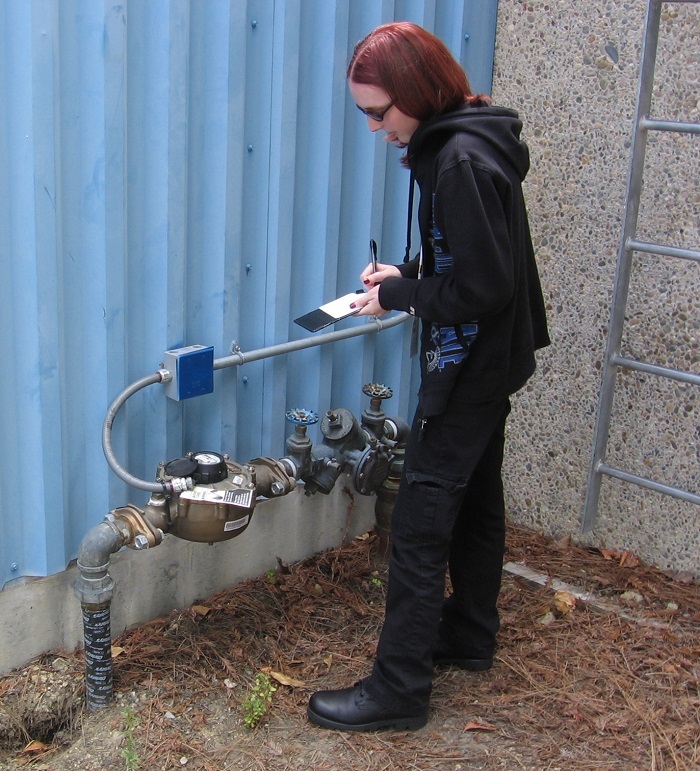 Katherine Pitts recording data from a water meter at NASA’s Ames Research Center in 2011 as part of a NASA DEVELOP study to determine the amount of water the center uses for irrigation. Image courtesy of Katherine Pitts. Research interests: Comparisons of global climate models to observation-based data; analyzing, developing, and testing algorithms for processing geophysical satellite data. Research highlights: NASA’s DEVELOP program provides opportunities for early-career scientists to use Earth observations to conduct research related to a wide range of global environmental issues. Started in 1999, DEVELOP is part of the Applied Sciences Program, and addresses environmental and policy concerns through the practical application of NASA Earth observations to the areas of agriculture, climate, disasters, ecological forecasting, energy, health and air quality, oceans, water resources, and weather. More than 350 DEVELOP participants each year conduct research at NASA centers and regional locations across the country. Katherine Pitts participated in the DEVELOP program in 2010 and 2011 while earning her master’s degree in meteorology at San Jose State University. Her research during two 10-week DEVELOP program sessions at NASA’s Ames Research Center at Moffett Field, California (about 40 miles south of San Francisco), is a good example of how early-career scientists in the program use Earth observation data to foster research designed to “bridge the gap between NASA Earth science and society” to address community concerns. During her first summer in the DEVELOP program, Pitts and her research team used the Environmental Protection Agency’s Better Assessment Science Integrating point and Nonpoint Sources (BASINS) model to evaluate flood risk at Ames under future climate scenarios. Because Ames is located at the southern end of San Francisco Bay, evaluations must consider not only rainfall, but also the risk of damage from erosion and flooding from tidal actions and storm surges, especially when combined with the effects of El Niño. A warming climate is expected to produce more frequent and intense rain events in this location. Flood risk at Ames also is expected to rise with a projected increase in impervious surfaces (such as roads) as the area grows in population. To study past flooding events, the team collected measurements from the Moffett Field meteorological station, the National Centers for Environmental Information (formerly the National Climatic Data Center), the California Irrigation Management Information System, and the National Solar Radiation Database. They also collected digital elevation models from the United States Geological Survey. These data were used to run the BASINS model to simulate the mean daily streamflow across Ames when rain events similar to those that occurred during the strong 1997/1998 El Niño happen in a projected warmer climate. During her second summer in the DEVELOP program at Ames, Pitts and her colleagues used the Ames Terrestrial Observation and Prediction System (TOPS) to analyze the impacts of projected climate change on different California ecosystems for the period 1950-2099 based on climate data from NOAA’s Geophysical Fluid Dynamics Laboratory models. TOPS uses input from satellite, aircraft, and ground sensors as well as output from weather, climate, and application models to make forecasts of ecosystem conditions. The California state data were separated into regions of similar climate and watersheds of interest. The team conducted a statistical analysis of the TOPS output of monthly temperature, precipitation, gross primary productivity, evapotranspiration, soil runoff, and vapor pressure deficit. After completing her DEVELOP work and earning a second master’s degree in atmospheric sciences, Pitts began her full-time science career as part of the Geospatial Laser Applications and Measurements group at the Applied Research Laboratories at the University of Texas at Austin. Pitts’ work includes analyzing 3-D point cloud data that are produced from LIDAR measurements and developing algorithms to identify and label the data points as various natural or manmade features, such as trees, buildings, and roads. One of her current projects focuses on developing algorithms for geophysical data products over land for NASA’s upcoming Ice, Cloud, and Land Elevation Satellite-2 (ICESat-2), which is scheduled for launch in 2018. The specific data product on which Pitts is working is called ATL08, and will provide along-track terrain and canopy heights derived from laser altimetry measurements that will aid in applications such as mapping forest structures, estimating biomass, and improving digital terrain models. The Advanced Topographic Laser Altimeter System (ATLAS), a photon counting LIDAR, is the sole instrument aboard ICESat-2. ATLAS data will be used primarily to produce extremely accurate measurements of polar ice sheet thickness and topography as well as height differences between the polar oceans and sea ice. ATLAS also will be used to produce highly accurate measurements of land topography and to characterize vegetation. Since ATLAS data won’t be available until after ICESat-2 is in orbit, algorithm testing is being conducted using an instrument called the Multiple Altimeter Beam Experimental LIDAR (MABEL). MABEL was developed by NASA at the same time as ATLAS to serve as a testbed for ATLAS. Pitts utilizes MABEL data to analyze, test, and develop her geophysical algorithm. In addition to MABEL data, the algorithm on which Pitts is working also incorporates data from the Landsat Tree Cover dataset to set a flag indicating whether vegetation is expected in the location being processed. Additional algorithm testing is being conducted utilizing data derived from sampling Goddard LIDAR, Hyperspectral and Thermal Imager (G-LiHT) airborne LIDAR measurements and adding noise at rates that are expected when ATLAS is in orbit. Research findings: During her first summer of DEVELOP research, Pitts and her team used the BASINS model to evaluate various scenarios to determine which environmental and human changes might have the greatest effect on flooding at Ames. Changes in the models that decreased flooding potential were an increase in temperature and the conversion of urban lands to wetlands, which help retain water and slow the movement of water; changes in the models that led to an increased risk of flooding were increases in frequency and intensity of precipitation as well as increases in urban land surfaces (such as roads), which tend to allow water to flow more quickly. While the increase in precipitation frequency simulated the highest potential for flooding in the models, an increase in storm intensity also can produce a high risk of flooding if pumps at Ames cannot expel water faster than water enters retention ponds, as was experienced during the 1997/1998 El Niño season. The team notes that these results will assist master planners in developing new procedures for future Ames developments with a better awareness of anticipated climate change effects. In her work looking at the projected impacts of climate change on California ecosystems during her second DEVELOP summer, Pitts and her colleagues found that increases in maximum and minimum temperatures led to declines in peak gross primary productivity, length of growing seasons, and overall declines in runoff in the ecosystems they studied. However, changes in climate coupled with increases in impervious area due to intense urbanization are associated with an increase in winter runoff. Ames is located within the Coyote Watershed of California. Projections of increased temperatures and increased urbanization in this watershed show the potential for an extended dry summer season, which could threaten water availability. To counter this risk at Ames, Pitts was part of a team that conducted a study of the irrigation system to evaluate the amount of total fresh water used for irrigation alone. This study found that 41% of total water used at Ames went to irrigation. To address these issues, Ames plans to use reclaimed water for irrigation and expand the use of native landscaping. Along with these efforts, the research team recommended that Ames can further conserve water by implementing additional sustainability measures, such as increasing the number of timers and meters used in irrigated areas. Finally, in her current work developing the ATL08 algorithm for processing ICESat-2 ATLAS instrument data, Pitts verified that the algorithm is returning expected results. Soon, Pitts will begin work developing an algorithm for a related ATLAS data product called ATL18 that will provide gridded ground surface height, canopy height, and canopy cover estimates. Due to larger than desired orbital spacing in lower latitudes, ATL08 data may be combined with data from the Global Ecosystem Dynamics Investigation (GEDI) LIDAR mission to create a combined ATL18-GEDI product. GEDI, which is scheduled for launch in 2019, is a LIDAR that will be will be attached to the International Space Station (ISS) and used to measure ecosystem structure. Pitts, K., Little, M., Lowenstein, M., Iraci, L., Milesi, C., Schmidt, C. & Skiles, J.W. (2012). “Climate Adaptation Science Investigation (CASI) at NASA Ames Research Center: Using the Terrestrial Observation and Prediction System (TOPS) to analyze impacts of climate change on California ecosystems.” Proceedings paper, ASPRS Annual Conference, Sacramento, CA, 19-23 March 2012 [https://www.asprs.org/a/publications/proceedings/Sacramento2012/files/Pitts.pdf]. Pitts, K., Gonzales, A., Lowenstein, M., Iraci, L., Milesi, C. & Skiles, J.W. (2011). “NASA Ames Research Center climate change effects and adaptation research: Hind- and forecasting flood risk of NASA Ames Research Center using the BASINS model.” Proceedings paper, ASPRS Annual Conference, Milwaukee, WI, 1-5 May 2011 [http://www.asprs.org/wp-content/uploads/2010/12/Pitts.pdf].